One of the recurring emails, DMs and Facebook messages I get is to inquire about my two week travel guide to Cuba, especially what to do in Havana, Cuba. T and I impulse bought two tickets to Cuba last year during the JetBlue winter sale and spent 18 unforgettable days exploring the Caribbean gem long forgotten by Americans. Cuba is just 330 miles from Miami and a short four hour flight from New York City. We planned a four-night group trip in Havana, where we were joined by friends from Atlanta. We then headed to other cities on the island by ourselves for the remaining two weeks. Though Havana wasn’t my favorite city to discover in Cuba, it was definitely a fun place to be. Beyond being rich in history, the music scene is a can’t miss. The vibrant streets and high octane sounds of nightlife in Havana is one to write home about. We rented Casa Particulars the entire trip because we wanted an authentic Cuban experience and also to help locals directly by not staying in government or corporate operated hotels. In Havana, we stayed in Miramar, a quiet neighborhood that is home to several embassies and a short taxi ride from downtown Havana. We stayed at a gorgeous four bedroom mansion complete with outdoor space, personal bartender and chef for $75 per person. Upon arrival, our hosts greeted us with complimentary Cuba Libre cocktails and then prepped a divine lunch for us. It was raining that afternoon so we stuffed our faces with rice and beans, roasted chicken and an assortment of fruits and veggies and then proceeded to take naps. We kicked off our first night in Havana with drinks at El Del Frente, a posh restaurant in the heart of Old Havana. They have amazing cocktails and a rooftop overlooking Old Havana. We then had dinner at Otramanera and then bar hopped around town. We actually did a night tour by ourselves – Havana is super safe – and asked around for ETESCA wi-fi cards, which cost 1 CUC for 60 minutes of use. Read more about wi-fi and apps you need before you go to Cuba here. We had such a fun time taking vintage car rides, walking down the Malecon to just have rum and listen to music with the locals and drinking Cuba Libres until 3am. We even had a pool day at the iconic Hotel Nacional. 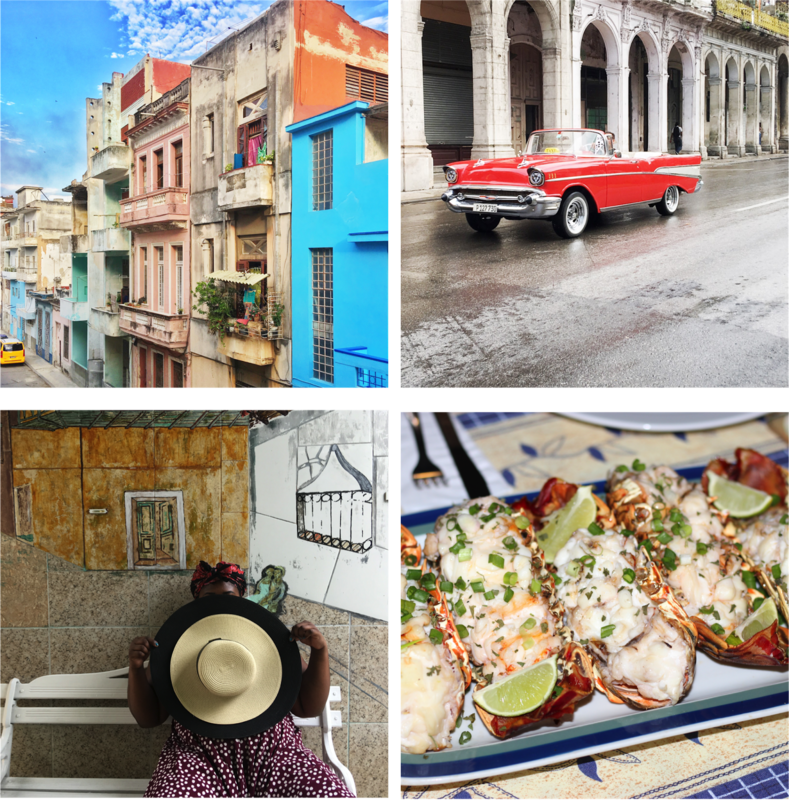 I’m putting together my two week itinerary but until then, here is list of what to do in Havana, Cuba. A modern and serene Spanish-inspired restaurant that stands out for its innovative preparations and excellent service. The salmorejo soup, salads and pork meloso are among the many stand -outs. It is a refuge from Havana’s chaos. It’s a great neighborhood block party with live music, cold beer and lots of dancing that takes place every Saturday afternoon. Must get there early before 10:30am when it gets jam packed with Tourists. Restaurant will start jacking up prices. Sightseeing: Fusterlandia – In 1975, after moving into a house in the rundown neighborhood of Jaimanitas outside Havana, José Fuster set about decorating his home in colorful mosaic. He then asked his neighbors if he could decorate their homes and business as well. His artwork covers the neighborhood in colorful mosaic that’s definitely worth the visit. A fairly new club with a South Beach vibe and great view of the ocean that features some of Cuba’s best musical acts.